This early parameter study shows an exploration by AVL and Dan Glass of the Volker Bromm supernova data with added density and detail layers. After further visual development, final high resolution layers were provided to Double Negative Visual Effects, London for further processing. Filmmaker Terrence Malick is often praised for the beauty of his films and their resonance with nature. Roger Ebert talks about his "painterly images." For Janet Maslin, it's his "visual genius" and his "intoxication with natural beauty." In Malick's new movie, "The Tree of Life," some of that natural beauty came from an unlikely source—the University of Illinois' National Center for Supercomputing Applications (NCSA). NCSA's Advanced Visualization Laboratory (AVL) has enlivened documentary television and IMAX movies for years. But their contribution to "The Tree of Life" marks the center's first work in a feature film. And perhaps the first time that a scientific supercomputer simulation has appeared in a feature. "In 2006, we started discussing the film with Terrence Malick and his team. We began to explore how NCSA could employ state-of-the-art supercomputer science to help create an experience beyond what any other film could provide," says Donna Cox, who leads NCSA's AVL. "Cosmic events are powerful visual metaphors for the human condition, and we wanted to combine accurate science with artistic sensitivity." 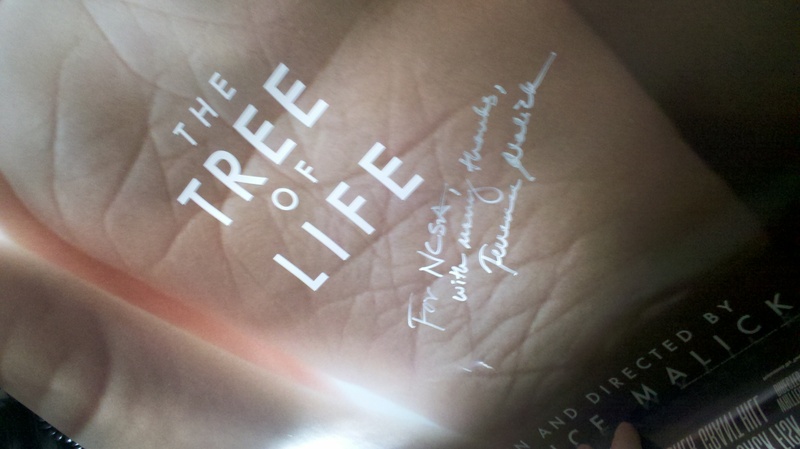 Signed poster from Terrence Malick thanking NCSA. For "The Tree of Life," the AVL team collaborated with Malick, Dan Glass (visual effects supervisor), and others to create two animated visualizations that are based on scientific data. The collaborative journey included exploring the data and testing a variety of camera moves, visual looks, and approaches. The NCSA team also developed new software to add detail and realism. "Donna and her team at NCSA were terrific to work with, bringing heart and soul to the scientific visualizations. We collaborated closely over many months to design the shots in question, deeply respecting the underlying science while shaping it into emotional imagery," Glass says. One visualization shows an awe-inspiring flight through a highly detailed galaxy model created at NCSA. Shown here is an early version of the NCSA University of Illinois Milky Way galaxy model. AVL worked directly with Dan Glass to customize the flight and visual settings for the "The Tree of Life" shot. The team also visualized a supercomputer simulation by Volker Bromm, an astronomy professor at the University of Texas at Austin. 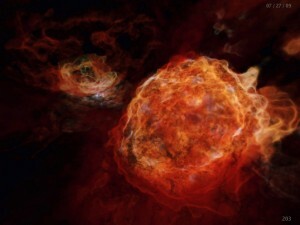 It shows how the very first stars appeared, illuminating the previously dark universe. Bromm simulated this event at the Texas Advanced Computing Center on their Ranger supercomputer over the course of 42 days. The calculation would have taken 114 years on your laptop. The results of the simulation are so significant that they were published in Astrophysical Journal last year. AVL took the scientific data and turned it into visualizations for "The Tree of Life." AVL's Stuart Levy processed the simulation results and extracted features that they chose to make visually prominent. Alex Betts developed custom capabilities for using scientific data to visualize cosmic gas and dust with great realism. Bob Patterson orchestrated the camera move and the design of the visualization. They worked on a cluster of computers dedicated to the AVL with about 200 processors. When they needed more power, they used NCSA's 9,600-processor supercomputer, called Abe. "Scientific visualization helps to infuse 'The Tree of Life' with an authenticity that goes beyond any other movie," Cox says. "We've employed the most advanced supercomputing, networking, and visualization technologies to bring some of the compelling, ferocious beauty of the universe to the big screen."